What came first, the chicken or the egg? Or in this case – what came first, the brewery or the taproom? This age old philosophical question comes with good reasoning, as we start the story of Alpha Acid Brewing in Belmont, which really started with Ale Aresnal. Settled near the corner of Laurel St. and Morse Blvd., Ale Arsenal was the brain child of owner Kyle Bozicevic whom opened back the taproom back in 2012 after realizing the lack of craft beer taproom options in the Peninsula. With that need now settled, Kyle got back to focusing on the brewing and alongside his partners had one goal in mind – bring you quality local beer, one small batch at a time. 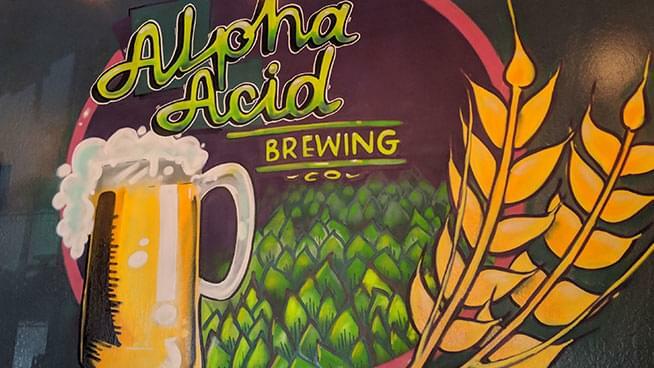 Which is why just a couple short years later Alpha Acid opened it’s taproom in 2014, and even made its grand debut at the 2015 San Francisco Beer Week Opening Gala. Taken best said from their website, they brew a myriad of unique beers; experimenting with ingredients every chance they get. Working on a double batch system means they have to brew twice the amount of the beer for a full batch to be produced and shared with the public, but this staple is in the process of expanding in order to bring their high quality brews to the masses! This modest Taproom, which for you locals is on the site of the original Devil’s Canyon Brewing Company brewhouse, is a quaint space that has fun games to keep your family (and four legged friends) occupied. A wide variety of IPA’s and sours are on hand, and if you’re lucky don’t miss out on trying their barrel aged constrictor series! While they don’t serve food, guests are welcomed to bring outside food.